The image features Panasonic Microwave Oven NN-CF874B. When you are adapting conventional recipes for the microwave, cooking times are reduced considerably. For example, a chicken which takes 1 hour to cook in a moderate oven will take 15 to 20 minutes on Medium-High Power in your microwave oven. If you aren’t sure how long to cook something, you can always look for a similar microwave recipe to help you adapt conventional recipes. A good rule of thumb is that it’s always best to undercook a recipe and then add an extra minute or two to finish it off. Liquids: Reduce liquids in a conventional recipe by one half to two thirds, e.g. 1 cup (250 ml) should be reduced to 1⁄2 cup (125 ml). Sauces and gravy: Add more thickening such as flour or cornflour to sauces and gravies if you do not reduce the liquid. Seasoning: Reduce seasonings slightly in a recipe where ingredients do not have time to simmer by microwave. Salt: Do not salt meats, poultry or vegetables before cooking; otherwise, they will toughen and dry out. Cooking time: If one ingredient takes longer to cook than the others, pre-cook it in the microwave oven first. Onion, celery and potato are examples. Browning: When cooking meat or vegetables, don’t use any of the oil or fat that would have been used in a conventional recipe for browning. Cakes: Reduce leavening agents for cakes by one quarter and increase liquids by one quarter. Biscuits: they require a stiff dough. Increase flour by about 20 percent. Substitute brown sugar for white sugar and use biscuit recipes that have dark spices or require icing. Because of the short cooking time, biscuits don’t have time to brown. Chill dough for half an hour before baking. This produces a crisper biscuit. Bake biscuits on a glass tray lined with greaseproof paper. Round shapes and rings: Since microwaves penetrate foods about two centimetres from the top, bottom and sides, mixtures in round shapes and rings cook more evenly. Corners receive more energy and may overcook. High water volume: Items with a lot of water, such as rice and pasta, cook in about the same time as they would on a conventional stove. Select recipes that convert easily to microwave cooking such as casserole, stews, baked chicken, fish and vegetable dishes. The results from foods such as grilled meats, cooked soufflés or two-crust pies could be less than satisfactory. Never attempt to deep fry in your microwave oven. 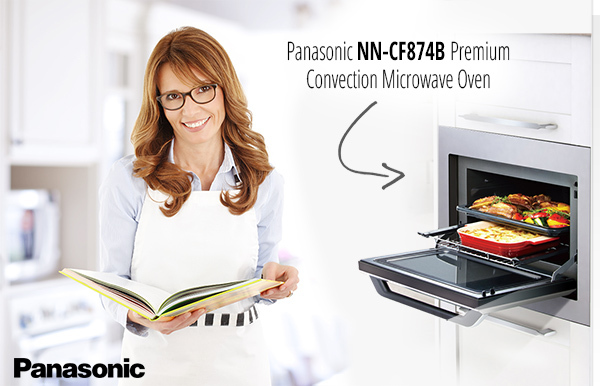 Check out the Panasonic range of microwave ovens and get cooking! Why would you get a convection microwave?